You are here: Home / Book Reviews / 100 Days to Christmas! Gasp! 100 Days to Christmas! Gasp! No, what I’m talking about is today’s release of this years Christmas planning ebook from Jennifer at ListPlanit. If you hop over there NOW and buy it today, you get it for FIVE DOLLARS. Imagine being totally prepared for Christmas. And I mean completely prepared. Not like those people who forget to go to the grocery store and invite people over for dinner. Talk about ADHD! Gifts purchased early and wrapped well in advance. Baking done at your leisure. Even having the foresight to plan simple dinners when you’ve got a holiday event or busy day. There’s more. Lots more. I just can’t remember all of it. What I do remember is enjoying Christmas instead of feeling frazzled. Feeling completely relaxed and non stressed about anything to do with the holiday. Everything gets done. On time. No – I take that back. Everything gets done early, leaving you to enjoy the holiday season with your family. FIVE DOLLARS people. Today only. Click over and grab your copy! Oh, and Jennifer has generously given you a little sneak peek. Here is an excerpt so you can see what you’ll get. That Jen, she’s organized. We ADD Moms could learn a lot from her. Full disclosure: You know I never try to sell you anything. I have to really, truly love something to mention it to you. 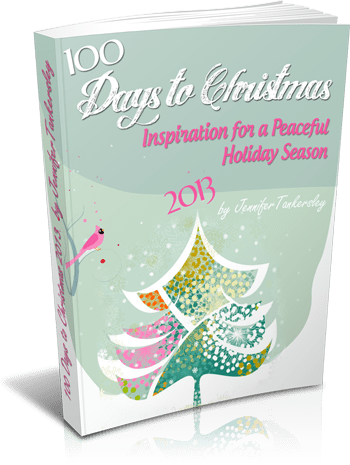 I have used Jennifer’s 100 Days to Christmas ebook for a few years now and I love it. I think you will too. And just so you know, the link to the product is an affiliate link. It means that Jennifer gives me a commission for telling people about her book. It doesn’t change the price for you, though. Just want you to know.